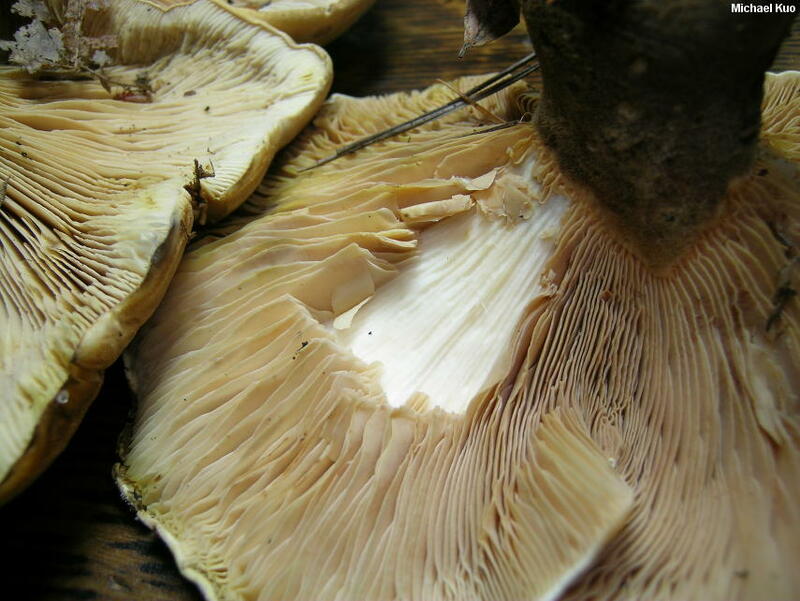 Here is a very distinctive and subtly beautiful mushroom. Found throughout northern North America and through the Appalachians, Tapinella atrotomentosa is easily recognized by its habitat on conifer stumps and decaying conifer logs; its gills, which run deeply down the stem and which are separable as a layer (see the illustration); and its velvety, dark brown to black stem. 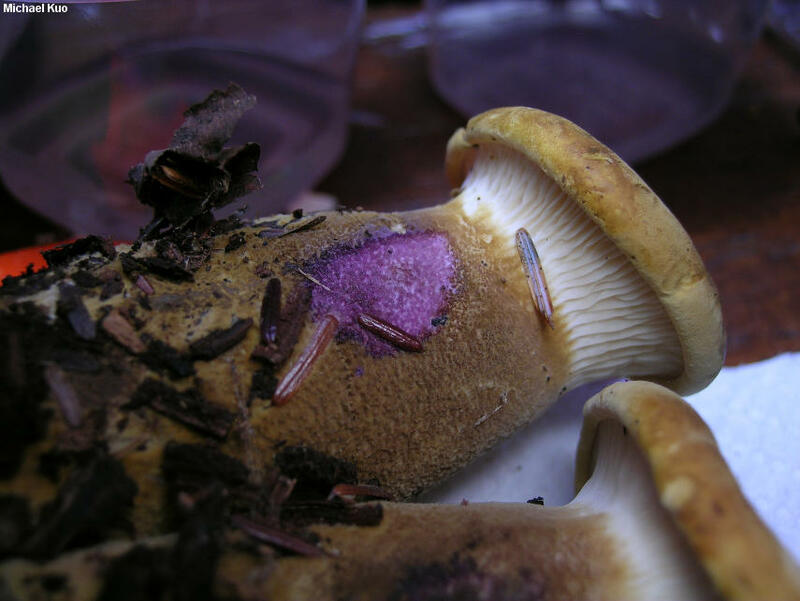 Older field guides treat this mushroom as "Paxillus atrotomentosus," but the classic members of the genus Paxillus, like Paxillus involutus, are terrestrial and mycorrhizal; in contrast, species of Tapinella (see Tapinella panuoides for another example) are wood-decomposing saprobes. Although chemical testing is probably not needed in order to successfully identify Tapinella atrotomentosa, its reaction to common household ammonia is so striking, purple, and unexpected that I recommend the test just for the fun of it. 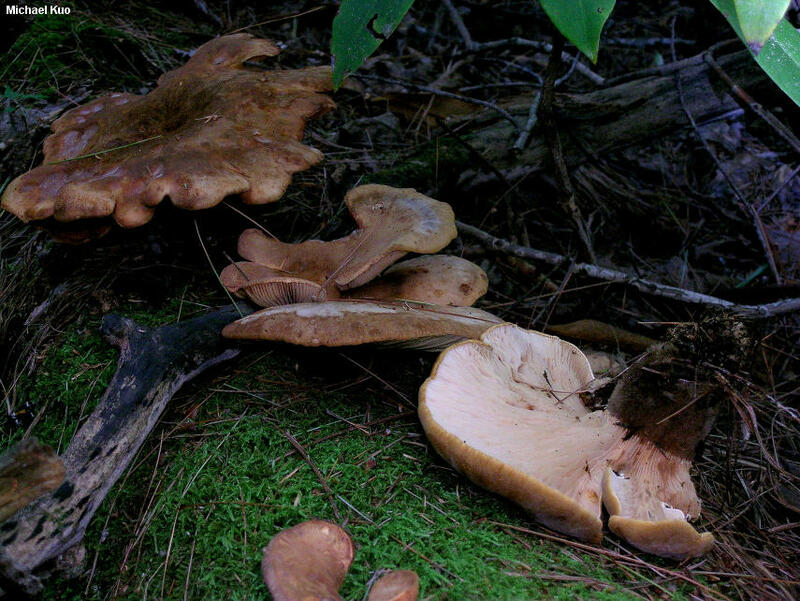 Ecology: Saprobic; growing alone or in groups, sometimes in clusters, on conifer stumps, decaying conifer wood, or on living conifers--also reported on the wood of madrone; causing a brown rot; summer and fall; widely distributed in northern North America and the Appalachian Mountains. The illustrated and described collections are from Michigan, Minnesota, Kentucky, and Ohio. 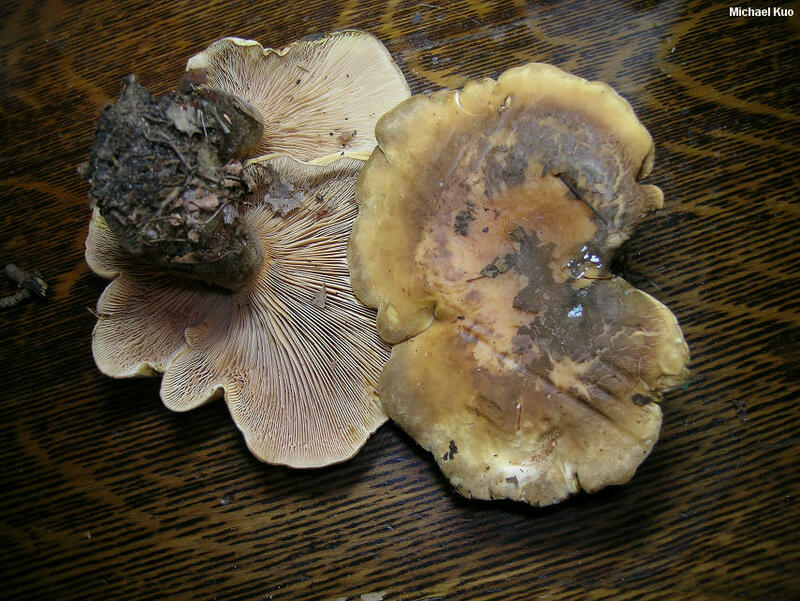 Cap: 5-14 cm; broadly convex, becoming flat or shallowly vase-shaped; dry; densely to finely velvety; brownish yellow to yellow brown or reddish brown when young; usually becoming darker brown in age, but sometimes retaining a yellowish margin; the margin inrolled at first, often becoming widely scalloped in old age. 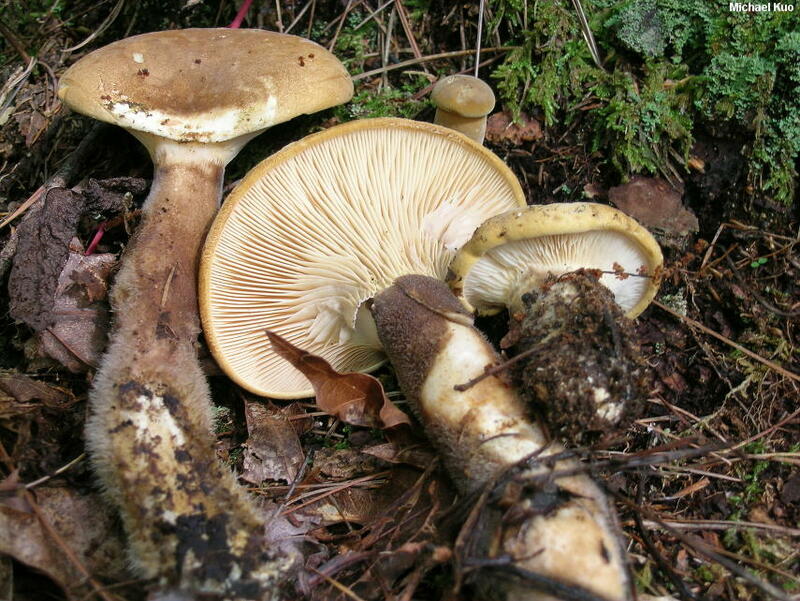 Gills: Running down the stem; separable as a layer; close or crowded; short-gills frequent; whitish when young, becoming pale tan or yellowish; frequently forked or with cross-veins near the stem. 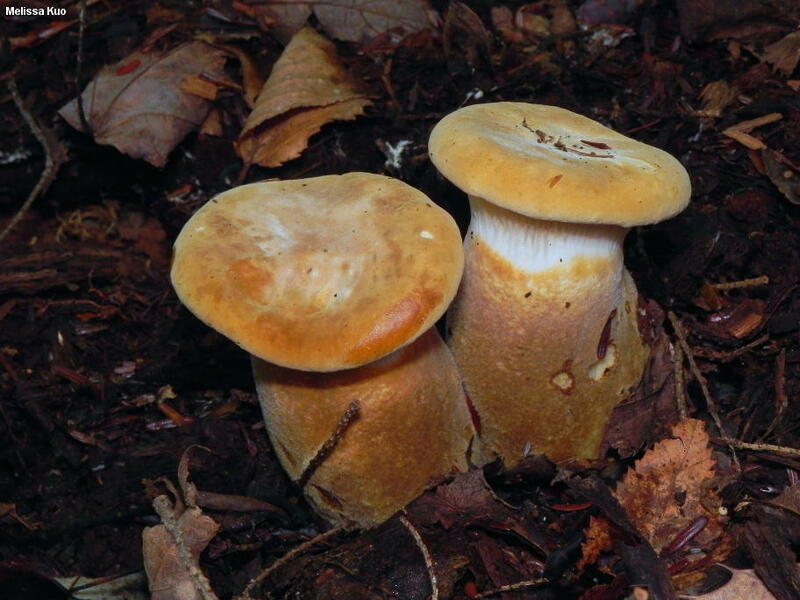 Stem: 4-10 cm long; 2-5 cm thick; equal, or swollen in the middle; occasionally off-central or even lateral; thick and sturdy; dry; whitish near the apex, but covered with velvety brown to blackish brown fuzz below. Flesh: Thick and firm; whitish to yellowish. Chemical Reactions: Ammonia bright purple on cap and stem surfaces. KOH black--or flashing green, then resolving to greenish black--on cap and stem surfaces; dirty olive on flesh. Iron salts negative on cap and stem surfaces. 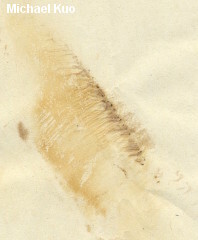 Spore Print: Yellowish brown to brownish yellow. 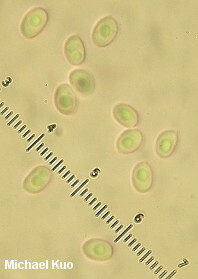 Microscopic Features: Spores 4-6 x 3-4 µ; ellipsoid; smooth; hyaline in KOH; dextrinoid. Hymenial cystidia not found. Pileipellis a tangle of brownish-in-KOH elements 2.5-5 µ wide; terminal cells cylindric-tubular with rounded to subacute apices, bundled in upright aggregations. REFERENCES: (Batsch, 1783< Šutara, 1992. (Fries, 1821; Atkinson, 1900; Kauffman, 1918; Smith, Smith & Weber, 1979; Arora, 1986; Breitenbach & Kränzlin, 1991; Phillips, 1991/2005; Lincoff, 1992; Barron, 1999; Roody, 2003; McNeil, 2006; Miller & Miller, 2006; Trudell & Ammirati, 2009; Kuo & Methven, 2014.) Herb. Kuo 09019509, 07200208, 09111004, 07291205.